Like In the Valley of Elah — which this film occasionally seems like an MTV/Varsity Blues pop variation of — most of Stop-Loss is set back in the States. The war is seen mostly in flickers and video-montages, the kind that keep a man up at night. In one particularly grueling scene set at a military hospital, a hideously scarred soldier confides that at night his ward sounds like a horror movie, with all the nightmares and screaming. Also like Elah, Kimberly Peirce’s script is steeped in oorah military brio and discipline, where there is little questioning of war itself. Stop-Loss is, however, a message movie, and no matter how artfully Peirce directs her cast and tries to avoid any sense of political polemic, there’s just no avoiding that message, a fact that nearly scuppers the whole film. Stop-Loss opened nationwide today. You can read the full review at filmcritic.com. Without Michael Shannon holding down Shotgun Stories with his glowering presence, the whole affair would practically blow right by without leaving much hint of its passing. The film hangs about in the quiet streets of and empty spaces surrounding a small Arkansas town where an ugly divorce has set two families at war with each other. At the start, both sides seem part ready to get on with their lives and part unable to, just aching for the leash to be let off. Although there’s violence and tragedy deeply etched into the landscape here, debut writer/director Jeff Nichols’ penchant for minimal acting and general quietude puts a damper on the proceedings without bringing much new to an old story. Shotgun Stories is in limited release now. You can read the full review at Film Journal International. Chicago 10 is in theaters now. You can read the full review at filmcritic.com. It’s hard to read Our Daily Meds without thinking of Americans as shaven-head underground dwellers of THX-1138, shuffling through their twilight days in a prescription-drug-haze. Although the admirably plain-styled author Melody Petersen does her best by the end of the book to provide a way forward, in case any crusading legislator decides to stop riding the Big Pharma gravy train and get on the case (Ralph Nader, where are you? ), it’s difficult for stories like the one just described to not have a hope-draining effect on readers. Our Daily Meds is in stores now, just in time for people concerned by the recent news about drug remains in the water supply (which the book covers as well). You can read the full review at PopMatters. There are about two or three different films fighting for control during David Gordon Green’s powerful but flawed Snow Angels, and in the end none of them win. An adaptation from the Stewart O’Nan novel, the film is at its core a dispiriting domestic drama in which single mother and waitress Annie (Kate Beckinsale) is trying to raise her daughter and deal with the encroaching return of her ex-husband, Glenn (Sam Rockwell), a onetime suicide case and drunk who has now found Jesus and wants back into Annie’s life. Set to swirling all around this ugly and embittered core are several stories that never quite seem to plug into each other dramatically, no matter that their characters are closely interrelated via love, friendship, family, and the shockingly violent turn everything takes in the closing minutes. Snow Angels is playing now. You can read the full review at filmcritic.com. It’s the rare American schoolchild of a certain age who didn’t dread that moment when the old projector would get wheeled out, as they knew that chances were it was going to be for yet another rainy-day showing of Albert Lamorisse’s Le Balloon Rouge. A fine film, of course, but something that could well be done without after the tenth screening. 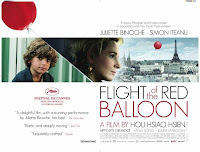 At the start of Hou Hsiao Hsien’s Flight of the Red Balloon, therefore, certain hearts will sink at seeing that big, red and round balloon bobbing impishly about in the Parisian streets, improbably following a curly-haired little boy through the city. Fortunately for those concerned viewers with bad classroom memories, Hou isn’t trying to simply pad out a well-known cultural artifact of yesteryear. Instead, the balloon works here as more of a grace note, an element of the fantastic which bobs into a prototypical Hou tale of disenchantment. Flight of the Red Balloon opened this week in limited release. Read the full review at Film Journal International.